Today’s news review looks at coverage of a report by the Education Policy Institute into teacher workload. Today, 10 October, the Education Policy Institute think tank released a report looking into teacher workload. 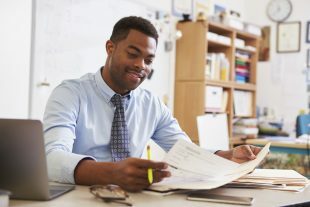 The research is based on already published figures from the OECD and claims that teachers in England work more hours than in many comparable countries but don’t spend more time with children or engaging in professional development. The story was covered on the Today Programme, the Sun and also on the Mail Online and the BBC’s website. TES and Schools Week have also covered the story. The Government is committed to tackling unnecessary workload and the report acknowledges the work the Department is doing, including empowering heads to challenge unproductive practices, allowing schools to develop competitive pay offers and a new standard for teachers’ professional development. We want every child to have access to great teachers that aren’t bogged down with unnecessary workload so they have the time and freedom to do what they do best - inspire the next generation. We recognise teachers’ concerns and are continuing to work with the sector to find constructive solutions to this issue. Teaching remains an attractive career and we have more teachers entering our classrooms than those choosing to leave or retire. Teacher retention has been broadly stable for 20 years and the annual average salaries for teachers in the UK are also greater than the OECD average, and higher than many of Europe’s high-performing education systems like Finland, Norway or Sweden. We trust heads, governors and school leaders to make sure their staff and teachers have all the support and professional development they need. We recently also brought together an expert group of teachers, headteachers and academics who helped design a new standard for Teachers’ Professional Development. The standard for Teachers’ Professional Development can be found here.